pamper – The Beauty Spot. If you follow me on Twitter you may have seen that I’ve had a full on working weekend. It’s rare that I get two days off in a row at any time of the year, let alone the run up to Christmas. So with days off as a premium, I like to make them feel really chilled so I can recharge my batteries for the next few days. Today, I’ve managed to prep some posts for #TheWinterProject which starts tomorrow (12/11/13), but I’ve also enjoyed a bit of a pampering hour or so before getting back to the blog! I don’t have a bath at home so really like to enjoy a nice hot shower and pamper myself. These aren’t all the products I used today, but I don’t use these every day so they were a real treat. Clarins Smoothing Body Scrub Smoothed onto dry skin before the shower to slough off any dead skin before I tan a little bit later. It’s quite gritty but leaves your skin sooooo soft after your bath or shower. For a slightly less intense scrub, I use this on damp skin in between my regular body scrubs. Jennifer Young Improve and Remove Cleansing Balm* I haven’t been using this for very long but it’s an organic cleansing balm which feels divine on the skin. 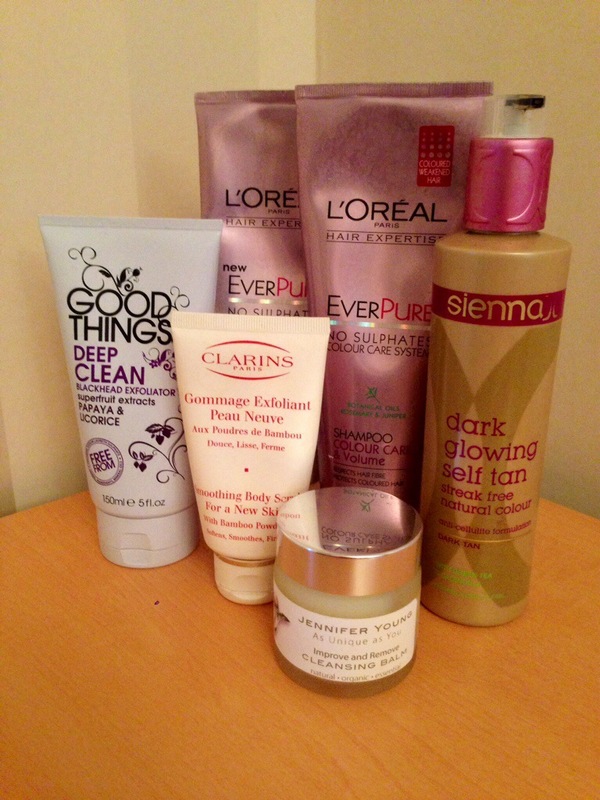 I am trying a few of the products from this range at the moment and am very impressed. I am putting together an in depth post about about my skin, it probably won’t be up for another few weeks but I’m hoping this will play a big part in it! Loreal Ever Pure Shampoo and Conditioner I use these every so often to change up my hair routine. I have been really impressed with them and always feel my hair looks much blonder and more refreshed when I’ve used them. I’m not sure about the ‘volume’ claim for these but I still like using them as a change from my usual shampoo and conditioner. Good Things Deep Clean Exfoliator A lightly grainy exfoliator that’s great to use on wet skin in the shower. The smell is a little intense for me as it’s soooo fruity, but I do really like the fact that it doesn’t have many of the nasties some skincare does have. Sienna X Dark Glowing Self Tan A real favourite of mine! I always feel good when I have a bit of a tan, and this is the only one I really reach for. I love the colour and it doesn’t streak and lasts me at least a week, winner! I hope you enjoyed seeing what made up my pamper this afternoon! What do you do to pamper yourself? *this product was given to me for trial.